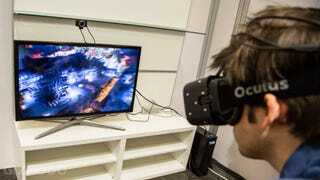 The Oculus Rift is a fantastic headset, but looking at stuff is only one part of VR. If you want to interact you need some sort of controller, and CNET is reporting that Oculus VR is working on its own first-party ones. According to CNET's sources "close to the development process" Oculus VR is currently developing several motion control-type controllers that would serve as Oculus peripherals. Of course there are already plenty of other third-party projects in the works with the Oculus Rift in mind, gloves, treadmills, guns, and more. The problem, of course, is choice. And what will actually take of in VR all depends on what developers of games implement. By making first party controllers, Oculus could easily establish a mainstay of what exactly motion control in the Oculus (and virtual reality) should be—like Sony's Project Morpheus will with its Move controllers—but at the expense of basically relegating third party upstarts to second class citizens.